On the 261st anniversary of Wolfgang Amadè’s birth (last Friday), the Handel & Haydn Society played at Symphony Hall a warm and delightful program of works by Haydn and Mozart. The association of these two composers, friends and colleagues, seemed a fitting tribute to one of the great composers of all times. Where Mozart’s was peripatetic, Haydn had a stable career as court musician to the Esterhazy family for 30 years. Their music defines the Classical era, with hints of harmonic and formal advances to come. Haydn (1732–1809) was considered a modern composer when the Handel & Haydn Society was formed, in 1815. Although now a stalwart, it is good to hear him with refreshed ears, to try and understand his work as when it sounded new. With the superb performance offered by the musicians of H+H, this is easy to do. It goes without saying that they are the cream of the crop: historically informed without stuffiness, conveying their love of this literature through every enthusiastic gesture, their commitment to dynamics and phrasing making the music live. Although the origins of Haydn’s three-movement Symphony No. 26, Lamentatione are obscure, it incorporates two tunes which were often sung at Easter, and the music may have been used in church service. The Allegro assai con spirito features a syncopated, urgent rhythm in the strings. The Adagio has deep, dark oboe, almost like an English horn, playing the “lamentation”. The final movement was a Menuet, with the trio featuring a jagged chord which one could almost imagine being used to wake up the drowsing concertgoer. Haydn’s humor is one of his most delightful characteristics. The Mozart Violin Concerto No. 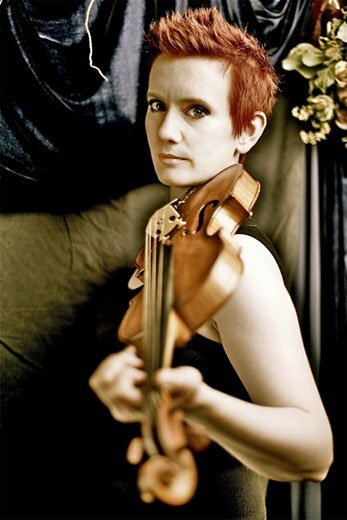 3, K.216 featured concertmaster Aisslinn Nosky. She had addressed the audience before the start of the program, mentioning the birthday and humorously stating that her jacket had no pockets and therefore could not contain a cellphone, a friendly reminder to the audience to silence theirs. Her brilliant scarlet frock coat with gold trim nooded to portraits of Mozart wearing something similar, constituting a visual reminder that Mozart lived in the era of the American and French revolutions, along with the more recently famous Alexander Hamilton. It was a nice change of pace from a traditional soloist’s gown; she stood out as leader but remained a member of the ensemble. Nosky directed the orchestra as well. After hearing this work mangled by so many young violinists at auditions, I found it a real treat to have it lovingly performed by a topnotch player. Mozart was famously dragged around Europe as a child prodigy, performing for royal courts and astonished crowds wherever he went with his talent. One of his earliest professional roles, at 13, was as concertmaster of the Archbishop of Salzburg’s orchestra. The G-major concerto is one of five he wrote in the 1770s, and most likely was first he performed. An effervescent work, it is full of joy, and Nosky made the most of it. The ensemble played like a well-oiled steampunk machine, gears visible but still elegant. Handel + Haydn continues to show it is one of the best ensembles around. After intermission, the orchestra performed Haydn’s Overture in D major that was originally part of a larger work, now lost. This fast-paced movement featured a few unexpected harmonic turns which reminded one of Mozart’s Symphony No. 41, though not nearly as long or complex. The concert concluded with Haydn’s Symphony No. 86. For it, the addition of timpani and trumpets made the stage seem suddenly full and the orchestra almost Romantically large. The opening Adagio – Allegro spiritoso was warm and elegant, moving into a brisk section with big dynamic contrasts and a flirtatious chromatic line. In the Finale: Allegro con spirito, the orchestra played with verve and speed, a lightning flash of a movement yet never out of control. 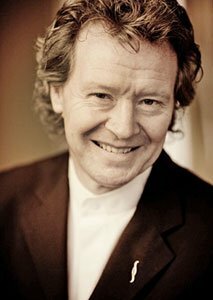 Artistic Director Harry Christophers did not use a podium, so was very much a part of the ensemble, and at times was almost dancing as he exhorted the musicians. Having the string players stand as well lent informality and immediacy: you can’t sit back in your chair if you don’t have one!